Frazier Machine manufactures a broad range of parts, from simple to complex, and from a single item or prototype to production work. We excel at machining prototype castings and custom- machined components used in aerospace, glass-making, alternative energy, electronics and automotive applications. We manufacture parts from 2mm to 120 in. 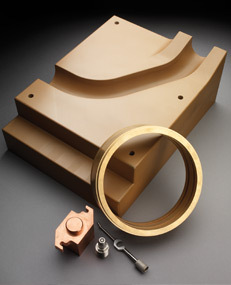 and perform most custom machining and fabrication processes. Facility – 18,000 sq. ft. of high-efficiency vertical and horizontal CNC machining centers, grinders, lathes, mills and saws. High-volume machining – Horizontal machining centers with automated pallet changers cut on three axes and process up to 16 parts at a time. Larger part sizes – Vertical milling center with gantry cuts on two axes in flat work pieces up to 10 ft. long. 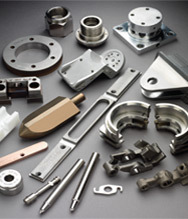 Materials - Our expertise includes machining of castings in aluminum, steel, iron and bronze. Additionally, we are proficient at machining stainless steel, aluminum, tool steels, plastics, yellow/red metals and carbon fiber. Faster from art to part. Fast turnaround and competitive pricing are the direct result of our commitment to customer satisfaction. Tool path generation at light speed – Our GibbsCAM system creates 3-D or 2-D CNC part programs and the required tool paths from prints or imported CAD files. Engineering assistance – First-time parts often need design adjustments. We suggest workable solutions and help optimize your design. Faster in-house fixturing – We design and build our own fixturing. Reduces costs and gets you from art to part a lot faster. Validation testing – We’ll test-run finished parts or prototypes right here through your equipment. Saves even more time. Frazier Machine is in NW Ohio, just off I-75 and I-475, within minutes of rail transportation, a Grand Aire freight hub, a major seaport and Toledo Express Airport. And we’re as close as your phone or keyboard.